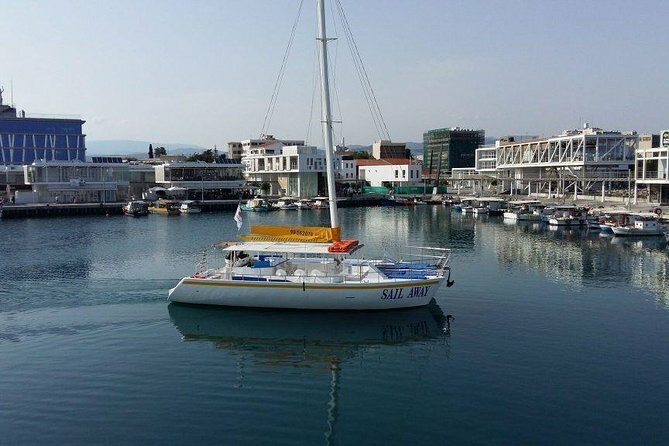 After hotel pick up, head to old port of Limassol to embark on a fun catamaran cruise. As you head along the west coast of Limassol, enjoy the sea breeze on your face and admire the Limassol coastline. Cruise on the clear blue waters of the Mediterranean Sea in comfort. Along the way you will be listening to soft music. During your first swim stop at Cape Gata, you may enjoy swimming and snorkelling for about one hour and a half. Also, you may simply bask in the sun. Cruise back along Limassol coast towards the unspoilt beaches of Ladies Mile Beach, with a further two hours stop for swimming canoeing and lunch. Served on board will be a buffet lunch. Last drop off at hotels is at about 4:30pm.